“Brazil is the future for the oil industry”..
Are investors put off by the risks of ultra deepwater drilling after the Deepwater Horizon disaster? If the frenzy down in Brazil is anything to go by – the answer is a staggering no. Brazil’s national oil company, Petrobras, has just raised a whopping $70bn in the biggest share issue in corporate history. And the actual demand for shares was double that. The reason for the excitement is the amount of oil in Brazil’s “pre-salt” fields, so called because they are trapped under several kilometres of seawater, rock and a hard-to-penetrate layer of salt. Some of the reserves are 7000 metres below sea level. So if you thought deepwater drilling in the Gulf of Mexico was difficult, pre-salt is even more challenging and potentially dangerous. And it could be very large. What is exciting investors and the industry is that estimates suggest the region may contain 50bn-100bn barrels of oil and gas, dwarfing Brazil’s current reserves of 13 billion barrels. It would place Brazil in the big boy league of oil producers, on a par with Kuwait and Russia. As the FT says “It would be hard to overstate the pre-salt’s significance”. And if people thought that the Deepwater Horizon would close the door on ultra deepwater exploration elsewhere, then they are wrong. 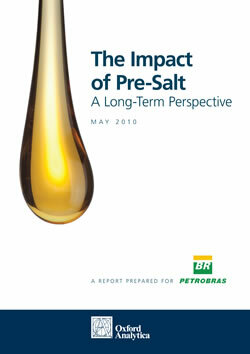 Actually, Petrobras raised 120 bi U$, update the inormation.